It's back and I'm so excited! My good friend Rachel (a.k.a Mrs.No.17) is working out the details for this year's Blog Sugar. 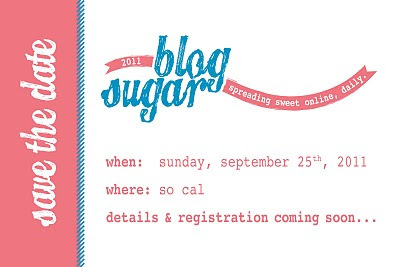 If you don't know - Blog Sugar is a networking event for local bloggers. We come together, eat, chat and discuss all things blogging while getting to know the people who's blogs we stalk read﻿ , in real life! I went last year and ended up late to another party I was supposed to be going to as I was chatting my little heart out! I got to know so many wonderful women and it just made my heart happy. Stay tuned for more details as I will be posting about them as soon as they are available. And if you're interested in attending: Let me know so I can send your email to the ladies who coordinate and we can get you on the list!! There is a new oh-so heavenly destination in town for the shoe obsessed woman. Sole Society.com﻿ - a new site that features a personalized selection of shoes each month of for $44.95 with NO obligation to buy!!! Designer quality shoes at a reasonable price will give you a reason to shop each and every month. The shoes, by Marco Santi, are on-trend, affordably priced and incredibly chic! Even if you weren't into shoes before......you will be now!! "Do not spoil what you have, by desiring what you have not; but, remember that what you now have was once among the things you only hoped for." What a great reminder to us all to really focus on what we have and not what we want.﻿ In a culture such as ours where people are commonly described as the "haves " and "have nots" it's hard to enjoy what you have and not constantly desire/crave more. Bigger , better, shinier, newer. Attaining things will not make us happy. True happiness lies within and allowing oneself to be 100% content. Not complacent. Content. Meaning that you are happy with the way things are right then. But being satisfied with all the joyous things you have and are able to experience on a daily basis. It goes without saying that I've had babies on the brain as of late. I've written about my baby fever here,here and here. And, recently it's been taken to new heights because we are really doing this. Like really 'trying' for a baby. Too bad - it's the truth. We are. And we're excited. There have never been so many babies in the family as what we are looking forward to in the coming year. The wife of one of Babe's BFF's is 3months along (more on that later), our other friends (the Pierre's) had their Prince this past January and here we are......shooting for number two. There are fifty-eleven-thousand things that can go wrong prior to conception, at conception, whilst carrying a baby and once the baby arrives. My dad (the retired OBGYN) says that anytime a baby is born healthy and with no complications is a miracle. It's enough to make a girls head spin! Head over to TheSmartlySoCal.comright now!! Love is all around us and I make a concerted effort to not only speak of my love for others but to show them as well. The past few days have been kind of a love fest around these parts. SaturdayI woke up (rather early I might say) to a beautiful sunny California day. A perfect day to head to my hometown (the LBC) with Sweet Pea and go get our pretty on. The weather was lovely and as we cruised down the highway with the music blaring and singing along to the radio it seemed all was right with the world. We went and got our hair done and then spent a lovely afternoon with my dear friend Amber. Boy- was that a great, soul baring , heartfelt, self-discovery filled conversation! sigh. To all the lovers out there!! My cup runneth over these days and I want to share it with everyone. T.G.I.F y'all!!! It has been that kind of week and I am so looking forward to this weekend! We have some fun things planned as a couple and as a family that I'm pretty excited about. First thing tomorrow morning, the Sweet Pea and I are off to the LBC to "get our hair did" as it's that time for both of us. And I get to see my girl Ebony and chat it up while she makes me look snazzy. Sweet Pea also has another loose tooth and is hoping it comes out tonight. Teeth gross me out so I hope it's while she's with her Nana. After the hair salon I'll drop her off with my mom for their girls weekend and then head over to my dear Amber's for some QT. Then I have to hightail it back out to my neck of the woods and get 'spiffy' as I have a hot date with my husband. Awhile back we got gift cards to Roy's and we fully intend to take advantage of the 'free food'. Happy Thursday!! I'm featured today over on TheSmartlySoCal so mosey on over for a little FREE THERAPY and check out my piece! Oh and leave me a comment and tell me what you thought/think! !